Sometimes it seems like California has it too good when it comes to nature. Great beaches. Inspiring mountaintops. Epic scenery. And the biggest tress on the planet. Redwood National Park is crowded with such monsters. The forest here feels like a primeval temple, a devotion of sorts to ancient gods. Or, for a less pious perspective, the redwoods here are simply beyond your imagination. You’ve never seen a tree this tall. Alarmed environmental activists eventually intervened, pushing for responsible logging practices and preservation. 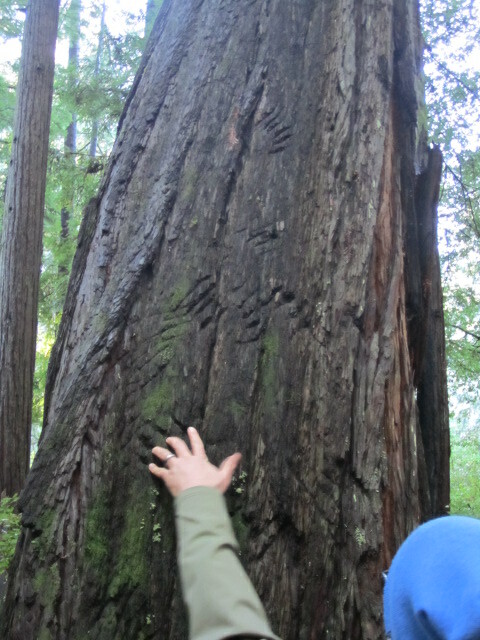 Their voices were heard, but large-scale logging continued in the area until Congress created Redwood National Park in 1968. 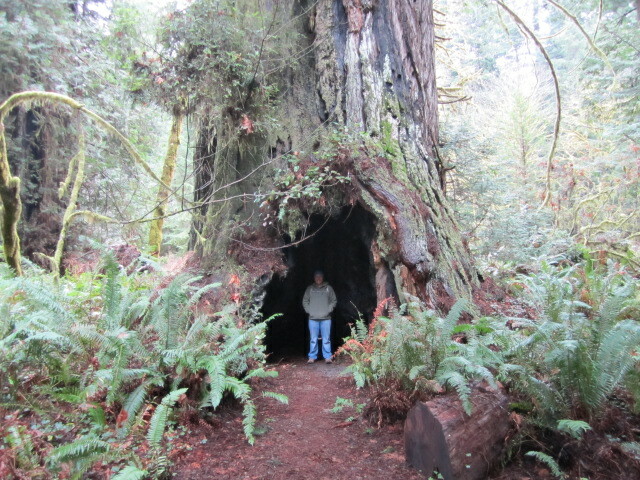 Here are a few photos from our recent redwoods camping trip. All it needs is a doormat. A maximum tree hugging effort for scale purposes. 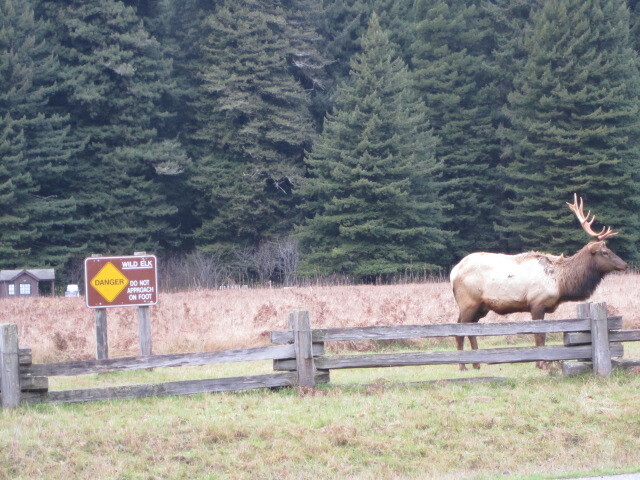 Safety first, says the elk. Claw marks left behind by a critter with big claws. 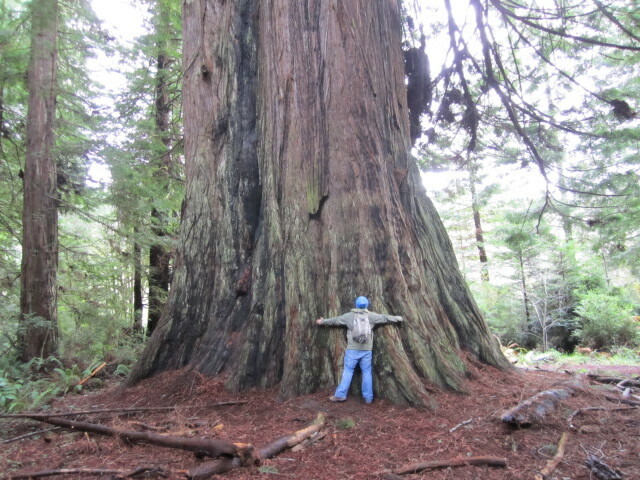 For more big tree action, read my post on sequoias. Why is it we’re always trying to get somewhere we’re not? I was riding a ski lift at Heavenly the other day with a friendly couple, both Tahoe natives. 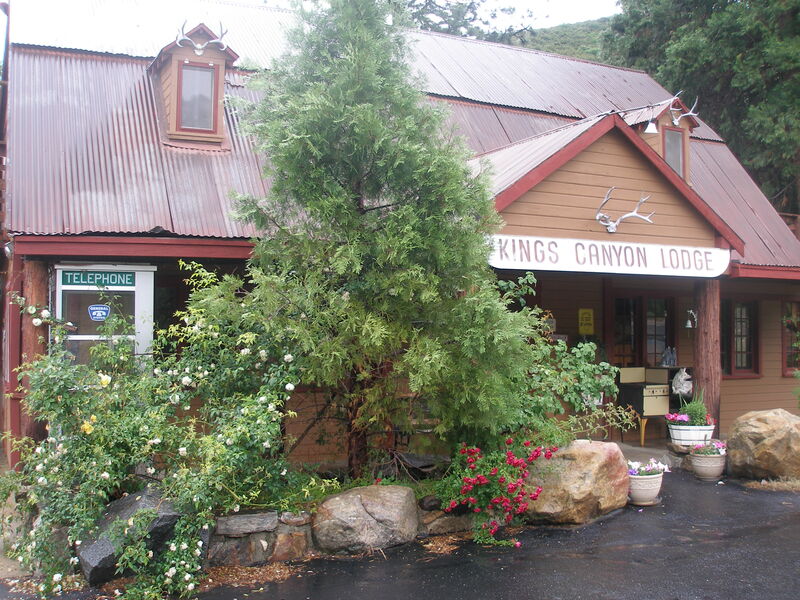 The woman told me about a Brazilian man they met on a lift who made a spontaneous decision to cut his business trip short to experience Tahoe. I’ve met so many people over the years who live somewhere beautiful and “can’t wait to get outta here.” I get it. You’re from there. You want to expand your horizons. Stop to smell the roses for a second, though. Take a deep breath. Look around you. If you live somewhere beautiful, be grateful every single day. If millions of people vacation where you live, nobody wants to hear about your eagerness to leave. Even if you don’t live somewhere as stunning as Lake Tahoe, I’m sure you can find beauty in the place. So go on, experience the world. Take it all in. But be “like a kid on Christmas” when you get home. One of my favorite topics, on film. Sweet. The only bummer here is having to wait a year to see the full-length. I think I might have a problem. I spend a lot of time in my garage now. Too much time, perhaps. Guess where I’m writing this post. Yep. Let me explain. My man cave (and I hesitate to use the term because of its ridiculous popularity lately, but I have no idea how else to describe it) is a constant work in progress. I have done a whole lot of manual labor setting this space up. You have no idea how difficult it is to prevent your wife from storing all her unwanted crap in your garage. It’s rather comfy out here, actually. I have a dirty black rug I rescued from a neighbor who abandoned it when he moved out. My dog loves it. Guess where he is right now. Yep. I have a cheap lamp from Target—my wife’s only piece of unwanted crap permitted in my cave—and this burly clamp lamp attached to the rafters. The lighting in here is very soothing. There is plenty of seating. Well, 3 chairs and a cooler. One of the chairs even has a footrest. Fancy, right? And I have plenty of decorations out here. Maps, pictures of nature doing nature things, a collection of old press passes and backstage passes, bulk coffee bag (whatever, it’s cool), dart board, mullet wig, and some fish decoration we bought on clearance. I have one of those little iPod charger/radio thingys, too. I enjoy being around my outdoor gear. Call me weird, but I like the idea of hanging out in a gear shop/living room which just so happens to be my garage. I burn incense and smoke cigars out here, something I’m definitely not allowed to do in the house. I fart when I want. Something I’m highly discouraged from doing in the house. Anyway, back to the problem. Me spending too much time out here. So I have one question for the dudes and one question for the ladies. Dudes, how much time do you spend on average per week in your cave? Ladies, would you suspect your husband or boyfriend had a problem if he started eating dinner out in the garage? I’ve been inadvertently jamming to a few travel-related songs this week. Clearly it’s a sign to pack my bags and hit the long, dusty road. A wise traveler can’t go on ignoring such obvious signs. The universe works in mysterious ways, as you are well aware. Thing is, most of these songs aren’t necessarily about traveling. They just mention mileage, or Greyhound buses, or being a long way from home, or what have you. I said wise traveler, which we all know I am not. Still, it’s a sign, damn it! I do have one travel-related question for you. Which headphones do you use when you’re on the road? Just curious. Me? Sony Noise Canceling MDR-NC7. They’re foldable. And they come with a sweet pouch. Anyway, enjoy the tunes. Happy Friday. And maybe even Happy Travels.